Undifferentiated embryonic sarcoma of the liver (UESL) was initially described as mesenchymoma by Donovan & Santull and subsequently by Scout. In 1978, Stocker et al. described the embryonal sarcoma (undifferentiated) as a clinicopathological entity, with the publication of a series of 31 cases. This is a rare entity with a higher prevalence in children over 5 years old. Nevertheless, it is second only to hepatoblastoma and hepatocellular carcinoma in terms of prevalence of malignant tumors in children. The diagnosis is established UESL correlating the findings on imaging studies (US and computed tomography [CT]), serum levels of alpha-fetoprotein, and the patient's age. The images may vary between solid and cystic lesions. When you have more prominently cystic, the main differential diagnosis is hamartoma mesenchymal and hydatidiform liver cyst. The case consists of a male patient aged 71 who had a clinical presentation of nausea, vomiting, and weight loss (20% reduction of its total weight), with palpable epigastric mass and painless to rise for about 1 month. On physical examination, it was noticed irregular abdominal mass, ill-defined, hard, and palpable 15 cm below the right costal margin. Patient was referred to the clinical and surgical oncology service at Haroldo Juaçaba Hospital/Ceará Cancer Institute, where he performed CT revealing the large expansive formation of solid-cystic complex aspect with gross septa measuring 26.0 cm × 23.0 cm × 16.0 cm, located in the left hepatic lobe topography and underwent hepatic lobectomy. Macroscopic examination of the surgical specimen showed large lesion measuring 24.5 cm × 22.0 cm, with heterogeneous cut surface with multilocular cystic areas and brown solid areas with extensive foci of necrosis and hemorrhage. Microscopic analysis revealed neoplastic cells with pleomorphic nuclei and high mitotic activity, dispersed in fibromyxoid stroma and large areas of necrosis [Figure 1]. The neoplastic cells had positive intracytoplasmic hyaline globules in staining of the periodic acid-Schiff (PAS). 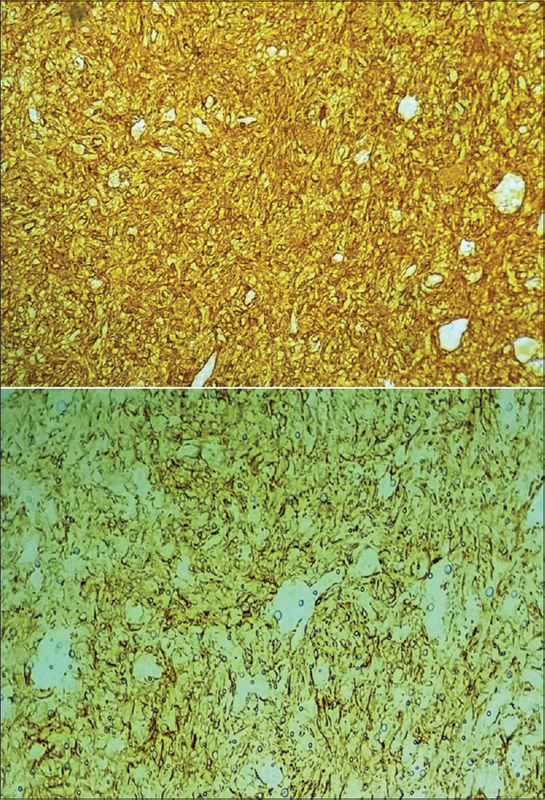 The immunohistochemical study showed positivity for alpha-1 antitrypsin, desmin, and vimentin on the suspected cells [Figure 1]. 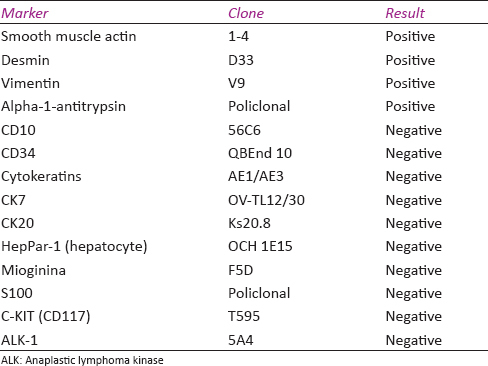 The findings corroborate the diagnosis of embryonal sarcoma undifferentiated [Table 1]. The patient progressed well in the postoperative period and was discharged with subsequent follow-up. Clinically, most patients present with abdominal distension palpable and painful tumor in the epigastric region or in the right upper quadrant of rapid growth. Some patients may present with nonspecific gastrointestinal symptoms and weight loss. The liver function tests usually have levels within the normal range. In some cases, there are reports of increased serum alkaline phosphatase. Fever, probably, due to hemorrhage and necrosis mass may be present. The mean age at presentation in adults is 25 years. The male/female ratio is 1:1.3. Clinical presentation is nonspecific with upper abdominal pain with or without palpable mass. May or may not be accompanied by systemic symptoms such as fever, weight loss, and changes in bowel habits, can rarely simulate an acute abdomen by appendicitis, due to rupture of the tumor with hemoperitoneum and peritoneal irritation in the right iliac fossa. The radiological findings on ultrasound and CT range from complex solid and cystic images, averaging 14 cm lesion size, showing myxoid, hemorrhagic, and mucinous components. In general, the ultrasound shows predominantly solid and echogenic mass with cystic lesions of minor component, which is on average a fifth of the tumor. CT scan, paradoxically demonstrates a hypodense lesion with hyperdense septa of variable thickness which enhance the contrast medium. Histopathologically, these are described as characteristics of expansive growth injury, extensive areas of hemorrhage, and necrosis. The cells are medium to large, fusiform, or pleomorphic multinucleated, withpresence of intra and extracellular PAS positive and diastaseresistance granules. The diagnosis of UESL is favored by some clinical and morphological features. The peak incidence is between 6 and 10 years of age, in comparison with a younger age in most patients with mesenchymal hamartoma (<2 years) embryonal and rhabdomyosarcoma (2–5 years). Typically, it has normal laboratory values of alfa-fetoptotein and carcinoembryonic antigen, unlike other tumors, such as hepatoblastoma and hepatocellular carcinoma. It is composed of pleomorphic spindle cells and giant cells, unlike mesenchymal hamartoma. 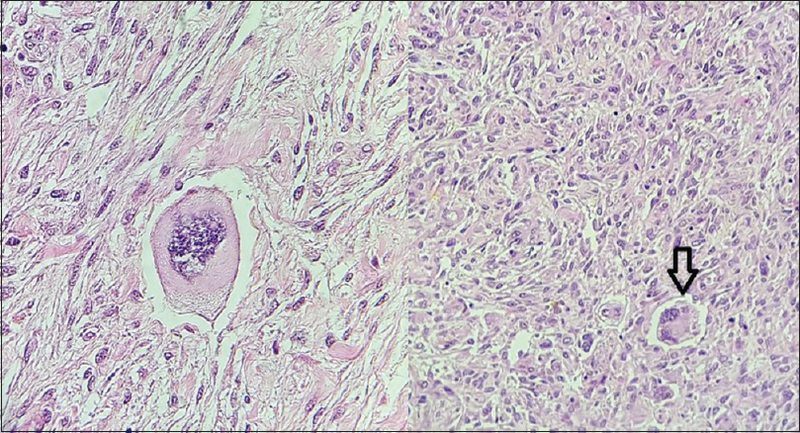 Finally, the neoplastic cells did not exhibit cross ribs, as observed in rhabdomyosarcoma. Moreover, the resistant cells and PAS-positive diastase are commonly found in embryonal sarcoma and is usually not seen in mesenchymal hamartoma, embryonal rhabdomyosarcoma, or other sarcomas involving the liver. In some cases, immunohistochemistry may be needed to help distinguish the embryonic sarcomas and other sarcomas involving the liver or sarcomatoid variant of hepatocellular carcinoma. The immunohistochemical characteristics of embryonal sarcoma are not specific, with a variable positive expression of cytokeratins vimentin, alpha-1-antitrypsin and alpha-1-antichymotrypsin,. Variable positive expression has also been reported, although less frequent, with the following markers: desmin, smooth muscle actin, actin muscle-specific, CD68, and lysozyme. In most series in embryonal sarcoma of the liver, there was no marking to S100. The markers are used primarily to exclude other tumors including hepatocellular carcinoma and hepatoblastoma (Heppar); embryonal rhabdomyosarcoma (myogenin); vascular tumors and fibrous solitary tumor (CD34); anaplastic large cell lymphoma and inflammatory pseudotumor (ALK-1); gastrointestinal stromal tumors (C kitcom cytoplasmic and CD34 marking); metastatic emelanoma neural tumors (S100); and metastatic clear-cell adenocarcinoma (PE10). Ultrastructural studies and immunohistochemical indicate the mesenchymal origin of the tumor, and some authors suggest that histogenesis is common among the undifferentiated sarcoma and rhabdomyosarcoma of the liver, probably due to a multipotent mesenchymal stem cell. Some evidence suggests that the sarcoma embryonic (undifferentiated) of the liver is derived, in some cases, the malignant transformation of mesenchymal hamartoma. Recent studies emphasize the possible involvement of specific genes, such as p53, in the development of embryonal sarcoma. The diagnosis of UESL implied; in the past, a poor prognosis, however, today, new experiments show better responses with longer disease-free survival at 5 years. Complete surgical resection is the great pillar of therapy. Due to its low incidence, there is no consensus in handling with surgery and adjuvant chemotherapy, the most recommended treatment. There is little evidence of adjuvant chemotherapy; however, some studies show improved survival and a lower rate of recurrence of injury, yet still requiring extensive evaluation and studies to create specific chemotherapy protocols. Embryonic sarcoma is extremely rare in adults and histopathological analysis is essential to confirm the diagnosis, since the radiological findings cannot claim a pattern of suspicious changes. Immunohistochemical study, although no specific markers, enables to rule out other types of sarcoma and metastatic tumors. Reaman GH, Bleyer WA. Infants and adolescents with cancer: Special considerations. In: Pizzo PA, Poplack DG, editors. Principles and Practice of Pediatric Oncology. Philadelphia: Lippincott Williams & Wilkins; 2006. p. 452-75. Moon WK, Kim WS, Kim IO, Yeon KM, Yu IK, Choi BI, et al. Undifferentiated embryonal sarcoma of the liver: US and CT findings. Pediatr Radiol 1994;24:500-3. Buetow PC, Buck JL, Pantongrag-Brown L, Marshall WH, Ros PR, Levine MS, et al. Undifferentiated (embryonal) sarcoma of the liver: Pathologic basis of imaging findings in 28 cases. Radiology 1997;203:779-83. Stringer MD, Alizai NK. Mesenchymal hamartoma of the liver: A systematic review. J Pediatr Surg 2005;40:1681-90. Pachera S, Nishio H, Takahashi Y, Yokoyama Y, Oda K, Ebata T, et al. Undifferentiated embryonal sarcoma of the liver: Case report and literature survey. J Hepatobiliary Pancreat Surg 2008;15:536-44. Nishio J, Iwasaki H, Sakashita N, Haraoka S, Isayama T, Naito M, et al. Undifferentiated (embryonal) sarcoma of the liver in middle-aged adults: Smooth muscle differentiation determined by immunohistochemistry and electron microscopy. Hum Pathol 2003;34:246-52. Kim M, Tireno B, Slanetz PJ. Undifferentiated embryonal sarcoma of the liver. AJR Am J Roentgenol 2008;190:W261-2. Sakellaridis T, Panagiotou I, Georgantas T, Micros G, Rontogianni D, Antiochos C, et al. Undifferentiated embryonal sarcoma of the liver mimicking acute appendicitis. Case report and review of the literature. World J Surg Oncol 2006;4:9. Weitz J, Klimstra DS, Cymes K, Jarnagin WR. Sarcoma indiferenciado (embrionário) de hígado em el adulto. Rev Chil Cir 2010;62:618-22. Almogy G, Lieberman S, Gips M, Pappo O, Edden Y, Jurim O, et al. Clinical outcomes of surgical resections for primary liver sarcoma in adults: Results from a single centre. Eur J Surg Oncol 2004;30:421-7.